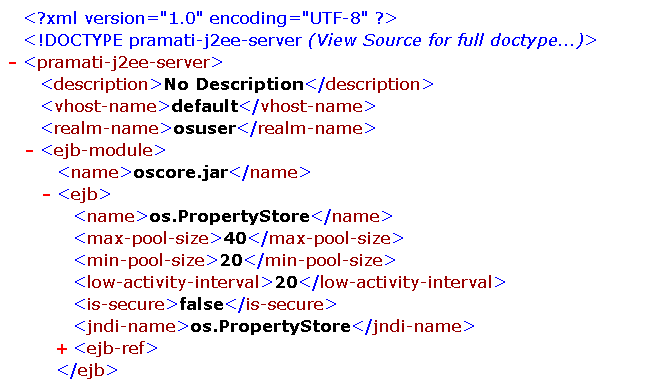 I think that someday all of our Java files will be stored as XML and our IDEs will use XSL/CSS to display them. That way there will be no more coding style wars. There will be a clean separation between code and code style. Not sure what you are referring to when you talk about code style. Is it formatting: like braces on new lines, 4 space indent or are you referring to coding conventions: static final variable names should be all caps separated by underscore. I do not think you are referring to conventions as having different variable names in the view and in the source would be very difficult. [WYS is no longer WYG]. If you are referring to formatting, then I am not sure why XML is required. Most IDE’s already have a separtion of view and document model. So to implement a feature like “show in my style” should not be difficult to implement over plain .java files. Hey Chris, thanks! Checked out you Colorize Java … JDE scheme is neat! I think I will give it a shot some time! It would be nice to have a button to hide all comments, perhaps by just hiding all text of the grey colour. Another thing i would like is where comments for specific fields and methods were provided as tooltip text. Dont forget that the purpose of HTML is about presentation, and so its natural that you get much more at your fingertips in terms of what you see than would be practical at a coding level. One thing i was working on within a Java app itself is where If, While, etc statements are put within their own box which are then collapsable thru a number of views based on a method’s cyclometric complexity. However this relies on ANTLR and so is a lot more technical than mere screen presentation.